Sony announced their updates to the highly popular superzoom cameras H5 and H2. Sony focus this year is on HDTV display of photos, the new Bionz image processor (also used on the Alpha DSLR) and face recognition. The lens is a 15x optical zoom 31-465mm (35mm equivalent). The 31mm wide end is good improvement over the standard 35mm, though not as good as the Olympus SP-550UZ. Sensor is 8.1 megapixels, with support for up to ISO 3200. There is face recognition, and focus prediction of fast moving objects. Viewing pictures on HDTV is possible with an optional component cable. The most impressive feature on the H9 (not on the H7) is the 3" flip out LCD. Image composition can NOT be easier on that giant TV screen. It also has a NightShot technology that allows for shooting in complete darkness. Definitely wait for the review on that feature to see how useful it is. 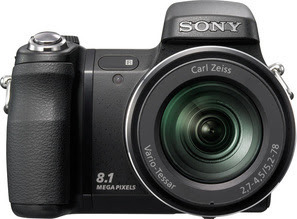 The H7 is cheaper with a 2.5" LCD that's half the resolution and no NightShot technology. The superzoom market has gotten very competitive this year. While last year's models were almost identical across manufacturers, every manufacturer makes some unique features this year. Also check out the Panasonic FZ8 with RAW.